As we’ve been travelling the world, longtime blog reader Jacques Vuye has been scouting ahead and recommending scenic and unique train trips. 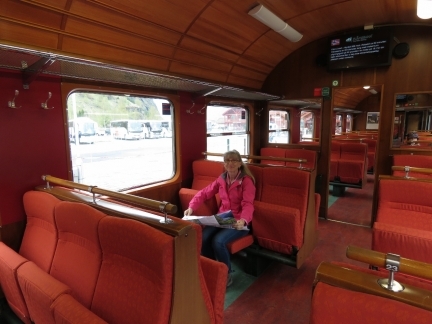 One of our favourites was the West Coast Wilderness Railway in Tasmania, Australia. 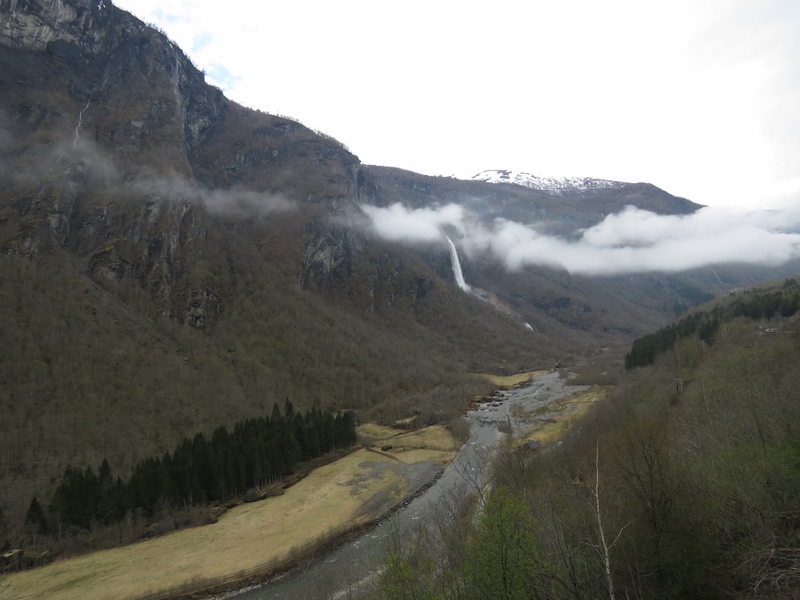 Shortly after we arrived into Norway, Jacques encouraged us to take a trip on Flåmsbana (the Flåm Railway), considered one of the world’s most scenic railway trips. 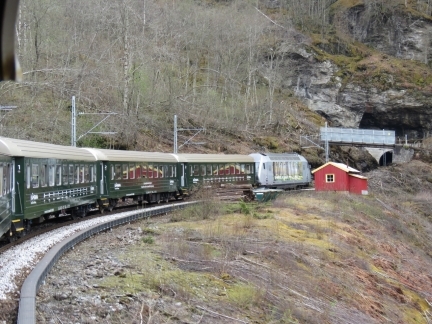 The train departs from Flåm near the end of 115-mile Sogneford, the longest fjord in Norway and the second longest in the world. 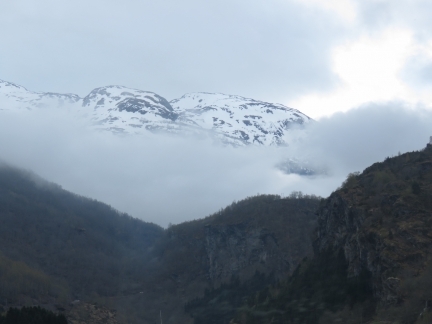 We initially planned to visit Sognefordon on the return trip south in August, but decided that it would be more beautiful to see the mountains with snow on them. So that was the initial impetus for our detour down Sogneford a few days earlier. Sitting on the train, ready to go. 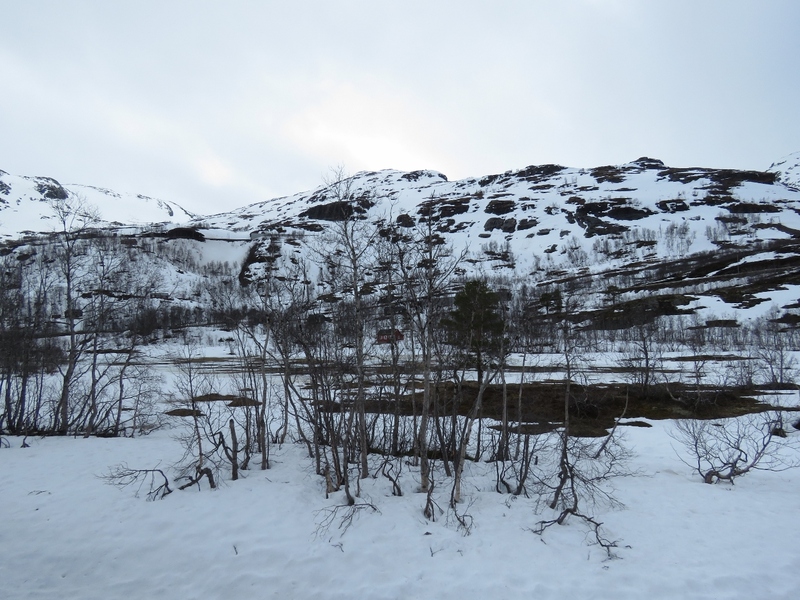 When we purchased our train tickets we realized another good reason to visit now instead of August is that the area is much less crowded with tourists this time of year. We didn’t have to travel far for some great scenery. 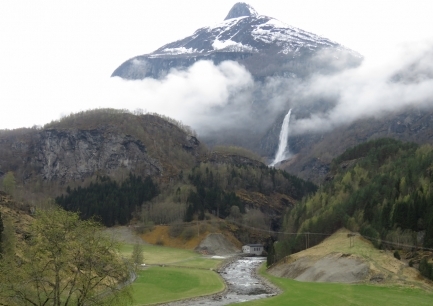 The 100m Brekkfosen Waterfall is just outside Flåm. Some of that snow-covered mountain scenery we were expecting. 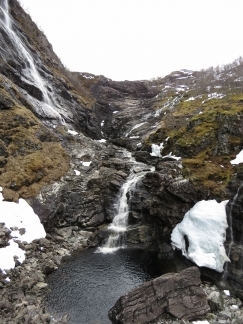 Looking southwest toward 4,133-ft (1,260m) Vibmesnosi Mountain and Rjoande Waterfall. 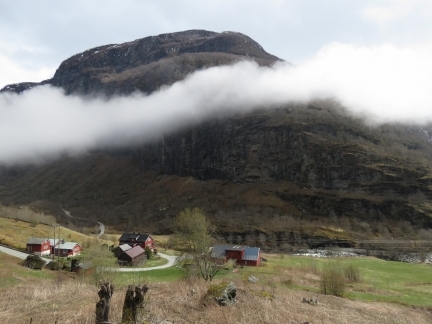 The picturesque village of Flåm, tucked into a valley below soaring cliffs, is well inland from the commercial harbour. 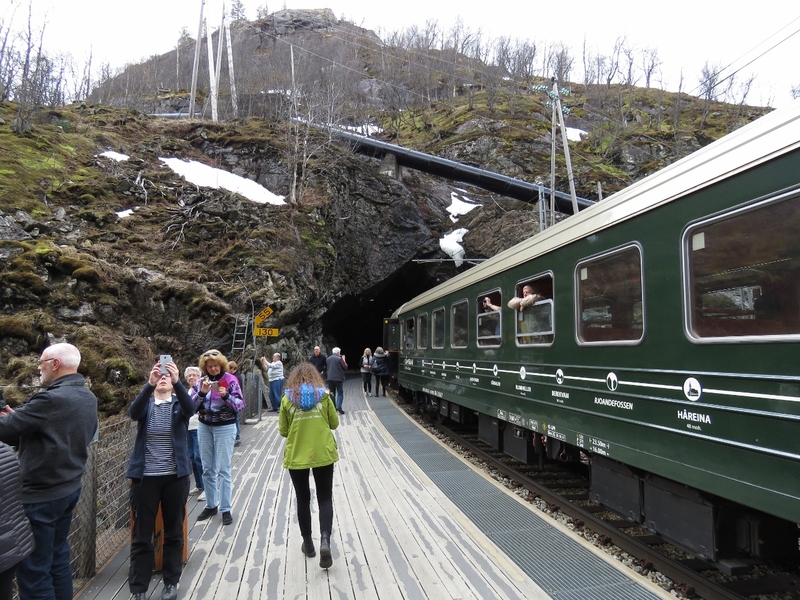 Entering the first of twenty tunnels that we’ll pass through en route to Myrdal. 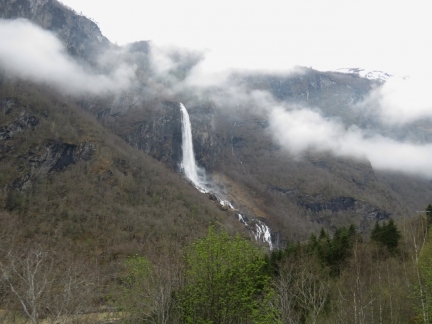 The spectacular Rjoande Waterfall with a 460-ft (140m) vertical drop. 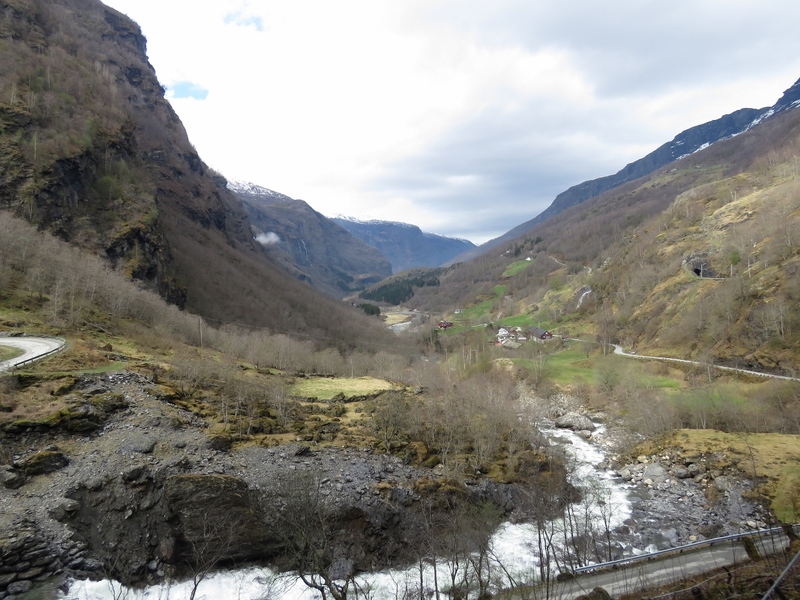 Looking back through Flåm Valley with the Rjoande Waterfall visible in the distance. 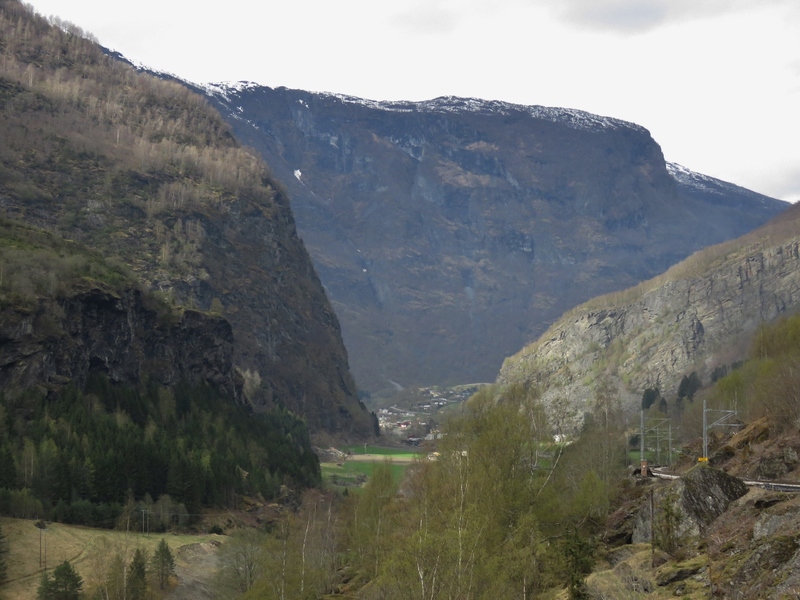 Ten minutes after departing Flåm Station we’re at already at an altitude of 715ft (217m) and eventually will climb to 2,841 ft (866m) to reach Myrdel. Almost 80% of the railway has a gradient of 55%, or 1:18. This is the steepest climb in the world for an adhesion-type railway using normal tracks. 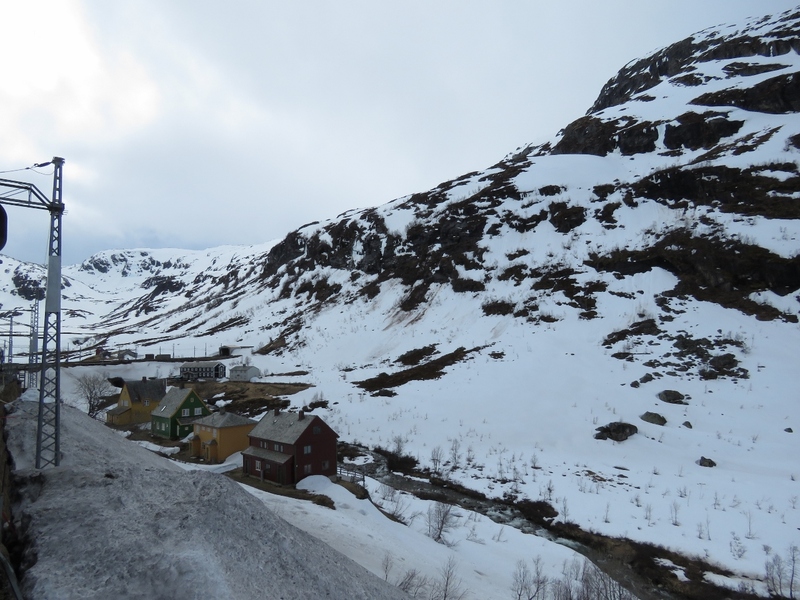 Farms and small settlements are all along the route. 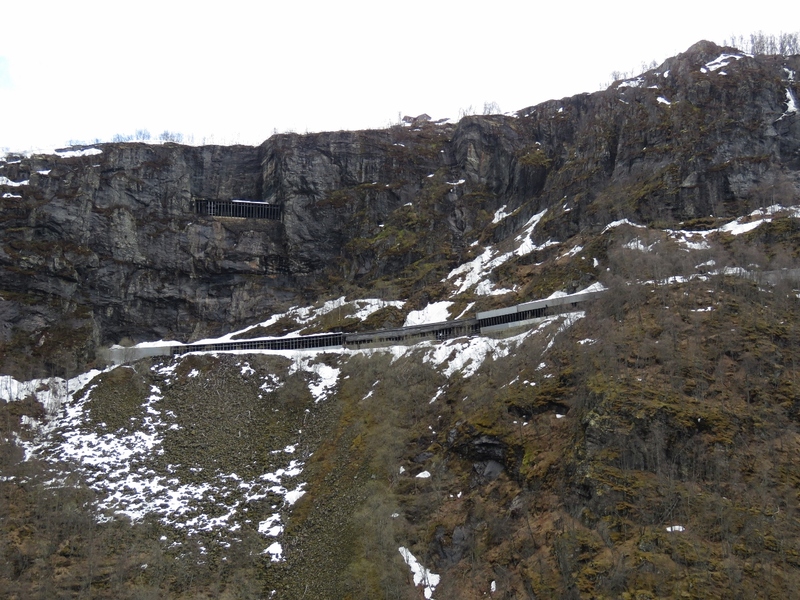 Before the Flåm Railway was completed in 1940 they would have been very isolated, particularly in the winter. 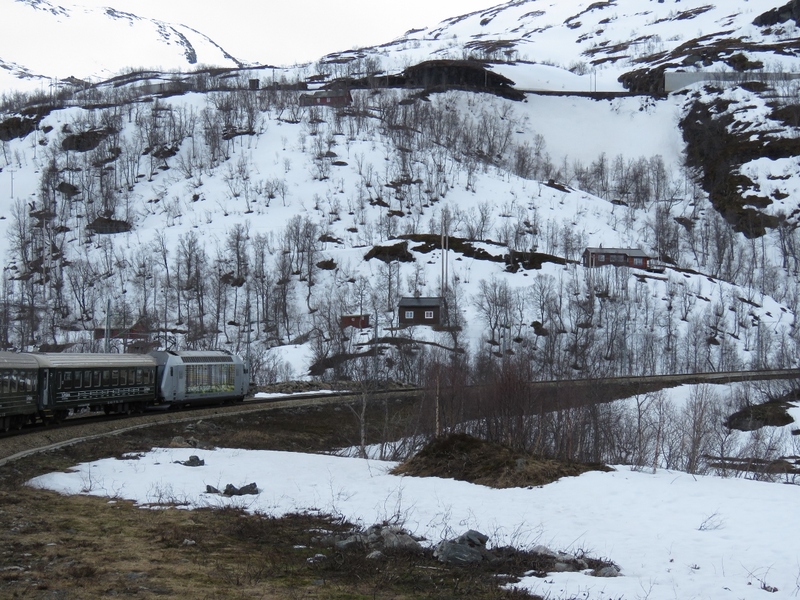 The Flåm Railway is single track the entire way except here at Berekvam where double tracks allow trains going opposite directions to pass. 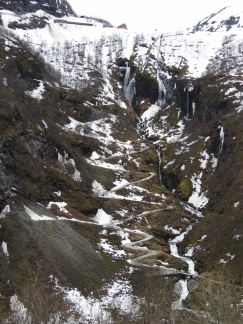 The Kårdal Waterfall at Kårdal, the highest hamlet in the Flåm Valley. Rallarvegen Road to Myrdal climbs Myrdal Mountain through an amazing 21 switchbacks beside a beautiful waterfall. The Flåm Railway climbs Myrdal Mountain through three switchbacks and the two tunnels visible on the other side of the valley, one above the other. 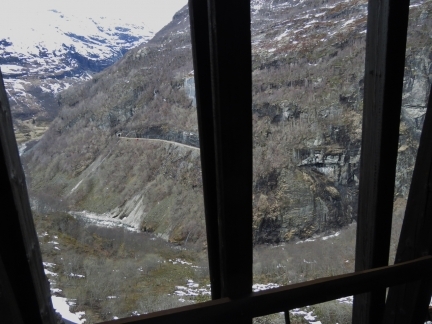 The lower tunnel, 2,916ft (889m) Vatnahalsen Tunnel, is one of only two tunnels on the line built using machines. The rest, including 639-ft (195m) Bakli Tunnel at top, were built by hand. 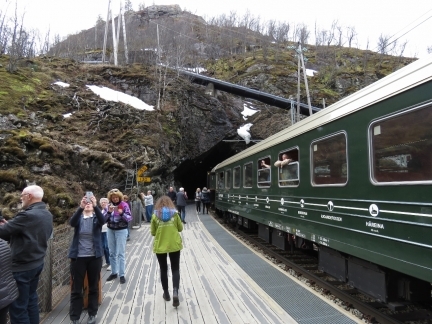 The train makes one stop along the way, at Kjosfoss Station, where passengers can disembark to take pictures. Kjosfoss Station is only there so tourists can view the waterfall Kjosfossen. 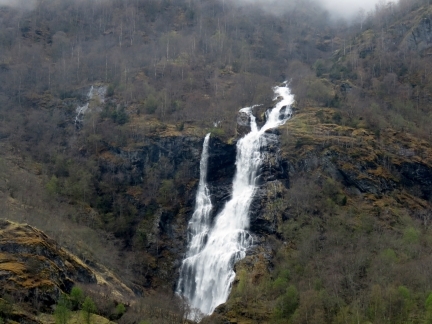 The pictures we’d seen showed a gushing torrent that filled the are with spray and mist. Given we were here during the spring run-off we were surprised that the flow was so low. 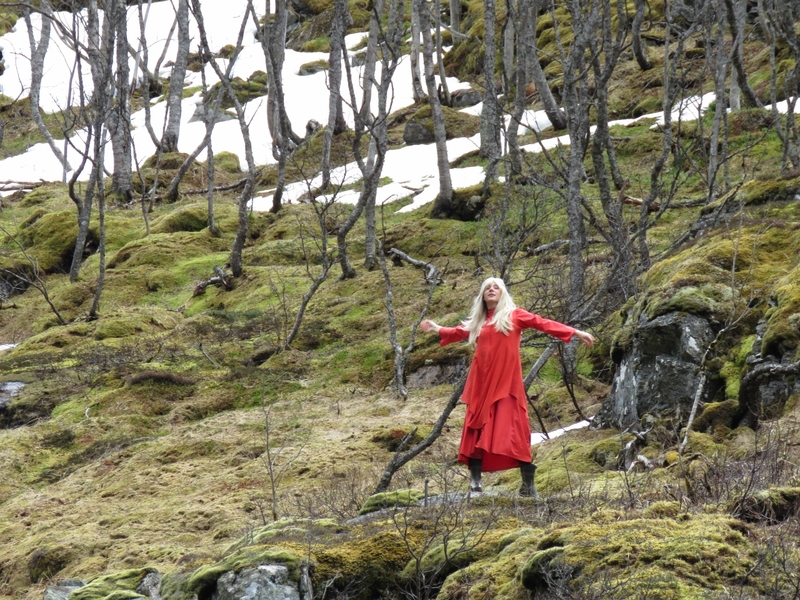 As we took in Kjosfossen, music began to play and women dressed in red danced at several places in the hills above. These apparently are dancers from the Norwegian ballet school playing Huldra, a seductive forest creature in Scandinavian folklore. 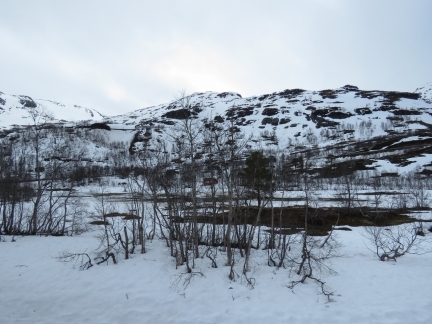 From Kjosfoss station at elevation 2,194ft (669m) we climbed through a series of switchbacks and tunnels and now are at 2565ft (781 m) and are above the snow line. Our train winding past houses through snow-covered fields. At Myrdal Station, elevation 2,841 ft (866m), the final station on the route from Flåm. Most passengers on the train are doing the return trip to Flåm to enjoy the view. 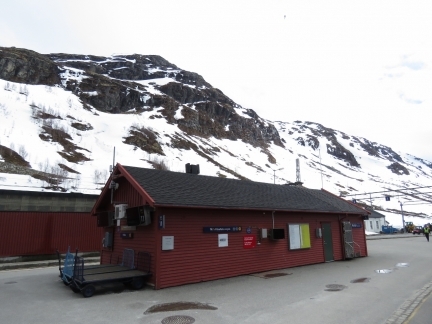 But a few will get off here and transfer to a train bound for Bergen. Looking southwest from Myrdal Station, where the tracks to Bergen lead into a tunnel. 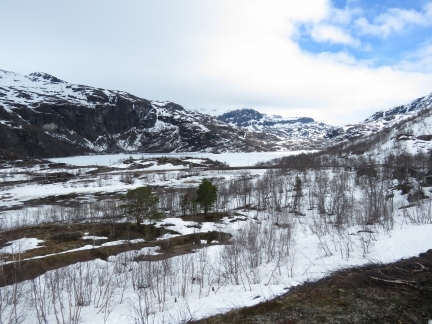 The view to snow-covered Reununga Lake on the return trip to Flåm before a horseshoe curve takes us into the two tunnels above Kjosfoss Station. Reununga Lake feeds Kjosfossen, so perhaps the reason Kjosfossen is not flowing so strongly right now is because the lake is partially frozen. Looking out through a “window” in Bakli Tunnel on the descent. It’s hard to believe that our train will be passing through that tunnel visible way below. Rather than build a bridge over the river Flåmselvi, the railway engineers instead diverted the river through a tunnel under the tracks. 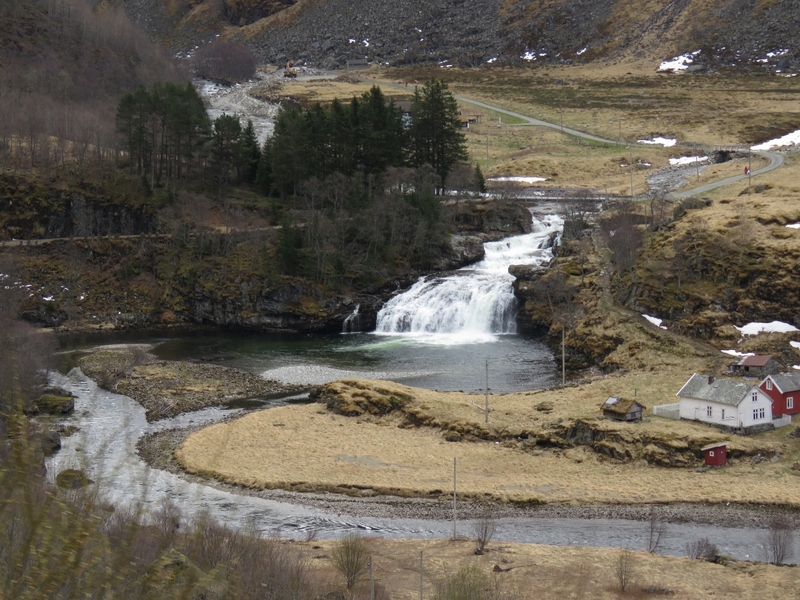 This is looking downriver as we pass over the tunnel. 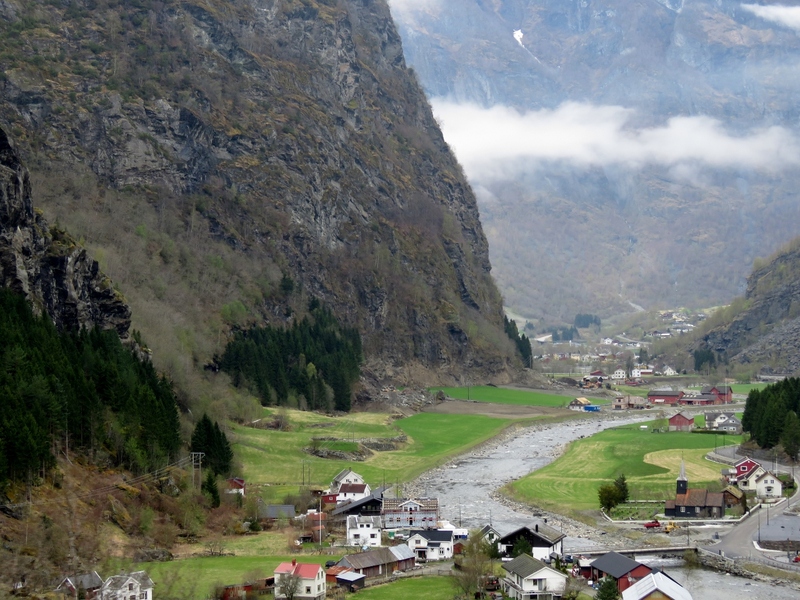 The village of Flåm just visible in the distance. We’re now back down to 695ft (211m). What an incredible journey. Nice to see you had a good trip with the Flåmsbanen railway, and Sognefjorden in general. Great pictures you post, as always. Hope you have a great time up north now. Thanks Trond. We’re having a great time and could easily spend years exploring Norway and still not come close to covering it all. Best report ever read on a Flamsbana ride! 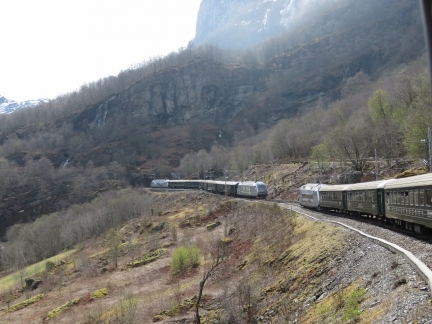 The locos are Swiss made and close relatives of the Swiss Federal RR SBB-CFF type Re 460. 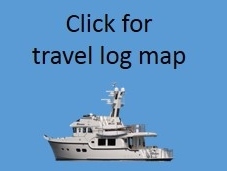 Thanks Jacques and thank you for recommending the trip in the first place. It was an excellent time to do it.